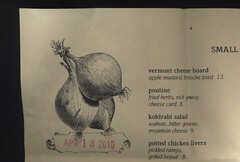 M & I made a quick trip to Vermont back in April to do some eating, drinking, and hiking, not necessarily in that order. We only made one big reservation, and, really, it wasn't that big. It was at the highly rated, but friendly and informal Bluebird Tavern. How highly rated? Well, among other things, it was one of about 30 semifinalists for a 2010 James Beard Award for Best New Restaurant (it and roughly 28 of the other semifinalists lost out to Marea of New York City). Burlington's Bluebird Tavern is a self-proclaimed gastropub perched above the Winooski River that, like many of Vermont's finest restaurants, specializes in all things local and sustainable and is an active member of the fantastic Vermont Fresh Network. I mean, just look at all this list of farms, dairies, orchards, and other producers that the Bluebird is teamed up with. Anyway, just having the goods isn't enough--you've gotta know what to do with it, right? And Bluebird Tavern's definitely got some firepower in the kitchen. Highlights included some utterly heavenly ricotta gnudi with brown butter and ramps (our first of the season!) and a very tasty, very refreshing julienned kohlrabi salad with walnuts, bitter greens, and "mountain cheese." Our mains weren't nearly as mind-blowing, but Michelle had a homemade spaghetti 'a la chitarra' dish that came dressed with some excellent veal meatballs, and my roasted chicken was a plump, juicy thing of beauty that was served on a mushroom & bread salad with a liver vinaigrette--too bad the salad was a little overdressed, because the chicken was the best we've tasted since we shopped at Fleisher's. One last thing about Bluebird Tavern that you should know: Tuesdays at the Bluebird Tavern are Tavern Tuesdays, and that means casual dining and bargain prices. You see, in addition to their normal menu items, the kitchen adds a trio of items for the low, low price of $10: house-ground double burgers with Vermont blue cheese, a boudin blanc plate with homemade sauerkraut, and Maine mussels with bacon, crème fraîche, and apple cider, all of them served with fresh-cut fries, all of them an exceptional deal. Oh, yeah: Bluebird's got a great selection of wines and beers, and they only brew Vermont Artisan Coffee. I'd read about Al's when I was prepping for this trip back in early April. Little did we know that our South Burlington hotel would be situated about 50 feet from Al's and their famous french frys. Things have changed a little since Al's first started up in the 1940s. Back then Al and Genevieve Rusterholz ran the place out of a hut with a window counter and no inside seating--"a small hut," apparently. These days, Al's has kind of a throwback diner look to it--definitely not overwrought and obnoxious like those ersatz '40s and '50s "diners" that you see just about everywhere these days, but they do pipe a soundtrack of vintage rock 'n' roll into the parking lot. The thing that hasn't changed is the quality of Al's frys. These are truly legendary french frys, with phenomenal texture, a rich color, and a deep potato flavor--quite possibly the best we've had since we paid a visit to Frit Flagey in Brussels back in '08. Even better, they sell them in handy pint and quart (!) sizes. (Trust me, unless you've got a fitting planned for later in the day, you're going to want to go with the quart. And if you do have a fitting planned for later in the day, you might want to cancel and reschedule.) And there's more to Al's than just frys. They serve up brilliant, classic diner-style burgers, beautiful hot dogs with crispy skins that have just the right pop to them, some awfully tasty soft-serve ice cream, and a wide range of soda fountain beverages. For all these reasons, and their quirky spelling of "fries," Al's was officially inducted into the America's Classics pantheon by the James Beard Foundation last week, and we salute them. Now, if you're a regular reader of "...an endless banquet," you may remember that we ran a couple of posts about Noma and our experiments with chef René Redzepi's Nordic Cuisine back in 2008 (pt. 1 and pt. 2). You wouldn't believe the number of times we've been contacted over the past two years by people who were desperate to get their hands on a copy of Noma: Nordic Cuisine and willing to pay top dollar to purchase ours. Thing is, we don't actually own a copy--never have. We had one on long-term loan from a good friend (the kind of friend who lets you borrow an extremely rare, extremely expensive cookbook for 6-12 months at a time [sometimes more than once!]). And even if we did, we certainly wouldn't sell it. No, not even to you. Anyway, we've gotten a lot of requests. And, not surprisingly, with Noma's recent coronation having driven its prestige to dizzying new heights, over the last couple of weeks we've gotten a whole lot more. We've also had people who, unable to get their hands on Noma: Nordic Cuisine, but eager to give Redzepi's cuisine a whirl, have fallen back on some of our featured recipes. Few have been as public about it as Christopher Hirst, however. Hirst wrote a snarky little piece in The Independent on the weekend called "The Day I Cooked Like the Best Restaurant in the World" that relied heavily on AEB and another online source. I think this is the very first time AEB has ever been referred to as a "transformative strainer. 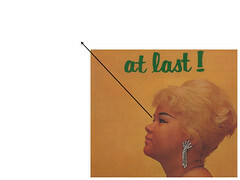 "** Hopefully, it's also the last. Then again, "the blog The Independent called a 'transformative strainer'!," has a pretty nice ring to it. Luckily for all you Nomavores out there, it looks as though a new Noma book is on the horizon. 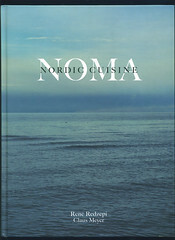 Hirst reports that a book called Noma: Time & Space in Nordic Cuisine will be published in the UK in September. Sure enough, Amazon.com & Amazon.ca are showing the same book (published by Phaidon) slated to be released on September 29, 2010. Will Noma: Time & Space in Nordic Cuisine help inspire a nouvelle cuisine nordique on this side of the Atlantic? One can only hope. * If you're Canadian and you follow such things, you probably already know that Canada didn't exactly "own the podium" this time around--not a single Canadian restaurant made the top 50, although two Canuck restaurants made the top 100. ** In addition to having gotten frustrated with some of the intricacies (and absurdities) of Redzepi's recipes, Hirst was evidently skeptical about some of our adaptations. The one major liberty we took in our "Noma 2: Manic Cuisine" post was fully documented at the time: not having any "balsamic plum vinegar" on hand when we made a variation on Redzepi's Cured Brisket of Pork recipe, we improvised a concoction of balsamic vinegar and ume plum vinegar that we thought might simulate the flavors of the original. Of course, we've never had the pleasure of trying balsamic plum vinegar, so we're not sure if we succeeded, but we can tell you that the end result was certifiably delicious. The other offending ingredient--toasted peanut oil--did appear in the original Noma recipe, oddly enough. We tried the same preparation with toasted sesame oil and it tasted great too, so we offered that as a possible substitute. Oh, yeah: Hirst wasn't crazy about our marriage of Redzepi's spice bread and his truffled poached egg, a combo that doesn't appear in Noma: Nordic Cuisine, but is based on elements that do. Hilariously, the photograph that accompanied Hirst's article was one of him fussing with this "complete bugger" of a preparation. Montreal has been in desperate need of a quality izakaya for years. Montreal's also been in desperate need of good ramen for years. Now, in the cozy confines of Kazu, we have both. 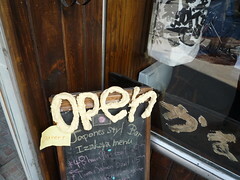 As you can see, our friends at Kazu are very much open for business. 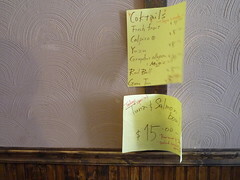 And, as you can see, Kazu touts itself as a "Japanes styl Bar" with an izakaya menu. That menu is extensive for dinner, short and sweet for lunch. A recent lunchtime selection included everything from a tuna & salmon rice bowl, to a 48-hour pork bowl, both of them substantial, both of them fresh and tasty. At $9, the pork bowl was a particularly generous portion, but it left me thinking that I'd be all too happy to fork over $10-$12 if they'd include a poached egg. That would push the dish from the exceptional to the ethereal. 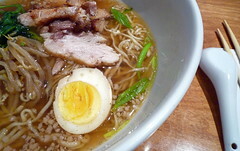 The other major offering was the superlative ramen bowl featured up top. The pork belly was buttery, the broth simple and satisfying, and the noodles were homemade (!). Kazu's ramen wasn't the most adventurous bowl of ramen I've ever had--it was more along the lines of "classic"--but it was a bowl of ramen I could imagine becoming a serious habit. And if all that wasn't enough, Kazu makes its own soft-serve ice cream. Yes! Some of us have been waiting for Kazu for a long, long time. PS--Helpful hint: taking a friend to Kazu for lunch makes for an awesome birthday gift.